Terroir (French pronunciation: [tɛʁwaʁ] from terre, "land") is the set of all environmental factors that affect a crop's epigenetic qualities, when the crop is grown in a specific habitat. Collectively, these environmental characteristics are said to have a character; terroir also refers to this character. The lesser known side of cannabis....the set of special characteristics that the geography, geology and climate of a certain place, interacting with the plant's genetics, express in terpene profile and cannabinoid percentages....that is cannabis terroir. Cannabis Terroir - The set of environmental factors such as soil composition, nutrient loading, biological concentrations and growing environment, interact with the plants genetics to express as varying ranges of terpene profiles and cannabinoid percentages. True terroir would mean planting directly into the native soil, so that the special characteristics of geogrpahy, geology and climate can influence the plants genetic traits. One of the key differences when comparing cannabis and grapes is that cannabis is a annual plant where grapes are perennial. Some would argue that true terroir cannot possibly be applied to a plant that resides in the soil for only one growing season. However, the art behind terroir lies in taking a closer examination at the chemical differences between grapes and cannabis. The chemical profile of cannabis, at a glance, appears to be infinitely more complex then that of grapes. Therefore it seems that a different set of variables can be arranged to describe the optimal terroir for cultivating cannabis. Using fish hydrolysate, kelp and crab meal are examples of its ocean essence. Geologically older rock minerals provide an additional layer of soil conditioning while earth's biological elements facilitate the interactions between the plants roots and these realms. Soil biochemistry plays a fascinating role in determining genetic expressions. Microbes that facilitate nutrient uptake and hormone regulation will help determine how the plant synthesizes nutrients to modulate it's cannabinoid profile. Examining other factors that influence nutrient uptake such as geography and climate will also be important. And all of these factors play in to local geographic micro-climates and available resources. The chemical and biological reactions between the roots and surrounding soil microbiology are just recently being understood. There is much to discover and the CHA intends to help facilitate and promulgate this knowledge through our website. Re-emerging paradigms such as organic, biodynamic and probiotic horticulture are being hailed as the new pioneers toward a sustainable and healthy modality. A particular grower from Humboldt (pictures to the right) has found that a particular group of nutrients compliments his soil profile the best. He also has found a local alpaca farm, where he sources the manure from those animals. The combination of this biochemistry allows him to perfect artisanal cannabis. He also uses compost teas to super charge the soil in between watering cycles. Terroir is an art and each cannaculturist will find they may need slightly different ingredients to optimize their gardens. The Niagara Escarpment is a cliff formation dating back 440 million years, the Silurian age in which 60% of marine life was wiped out; one of the five major extinction events in earth’s history. Skeletal fragments of marine organisms explain the regions high limestone concentration, calcium and humics. Incorporating Rhizophagus irregularis at the seedling stage offers additional nutrient absorption ability throughout the plant's life. Local organic amendments like composted manure and plant compost consisting of alfalfa, comfrey, and clover are used as top dressing and in compost teas throughout the growing season. Vermicompost is produced onsite using only local organic matter. Vermicompost and worms are added as a top dressing throughout the growing season. No commercial nutrients or fertilizers are used at all. 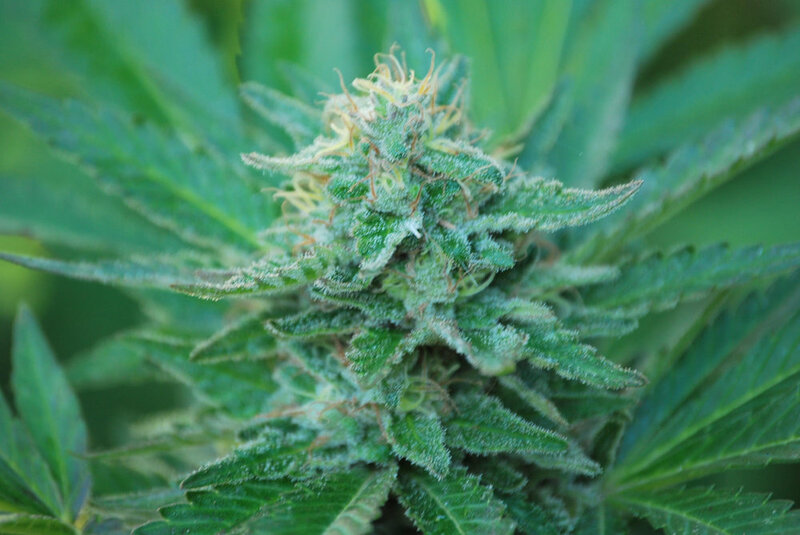 Over an eight-year period various cannabis plants were grown, and characteristics such as yield, aroma, texture, density, efficacy, and aesthetic qualities noted. Two strains were selected for having a combination most satisfactory: a Jamaican sativa and a Dutch bred White Widow. Crossing these two strains produced a cannabis plant with a voracious growth rate, significant yields and unique flavor and aesthetic qualities, with an earthy “over-ripened” fruit smell. While growing, this cannabis is very mold and mildew resistant and tissue samples show increased levels of silica vs. the same strain grown indoors, making the plants tissue stronger and less receptive to insects and pests. Warm summer days and cool nights with a SE exposure give optimal sunlight during the growing season allowing these plants to obtain significant size. During the last few weeks before harvest, day and night temperatures can fluctuate by as much as 20 degrees Celsius resulting in a beautiful “purple” plant response. The water used for irrigation is taken from a well located at the growing site. The only treatment the water receives prior to irrigation/added to compost tea, is that it is aerated for 36 hours. All in all, we feel like this plant is enabled to reach its fullest potential by way of its local environment, and continuous addition of local organic amendments. Although things can always get better, we’re pretty happy with the results so far. If you would like to contribute to our newly expanding library of cannabis terroir, please send us an email with some basic information of why you think your garden would qualify.